Just before leaving the U.S. to come back to Mexico this year I got scammed online. Not by any of the top online scams like the emotional message from Nigerian student or the fake antivirus software alert, but rather by an anti-aging face cream company (probably serves me right). The company runs ads on the internet to send you a free sample, saying you only need to pay the shipping. That’s how they get your credit card number. When you check the box thinking you’re agreeing to the shipping cost, you are actually agreeing to let them send you their expensive product monthly at the end of the “trial period.” Somewhere in that shipping information it says you have 15 days to cancel. Of course you don’t cancel because you don’t know you ordered anything. In my defense, I had in the past actually paid shipping and received single free samples as promised. I have learned that most times these days the box they are asking you to check authorizes the company to bill you monthly, regardless of the wording on the ad that leads you to think otherwise. Not that I’ve never been fleeced in Mexico, but it’s always been in person. Once it was a 14-year old selling tamarindo candy. This post isn’t about being fleeced online though. It’s about online shopping in general and how living in Mexico might save you money in ways you can’t imagine. When you read those vague statements about Mexico’s “lower cost of living,” you probably think of lower property taxes, lower dining and entertainment costs, lower food costs and lower utility bills. Those savings are real. But you save in other, much more subtle ways too. How much do you order online in the U.S.? According to Mintel, a global market research company, over two-thirds (69 percent) of US adults shop online at least monthly, with 33 percent shopping online every week. Last year, for the first time, people were doing more of their shopping online than in person. Not surprisingly, research shows people like the convenience, anonymity and the fact they can shop with their dog with them. Adults over 50 are the internet’s biggest constituency, and two-thirds of them buy online. What is more, 48 percent of online shoppers admit to occasionally increasing the size their orders to hit the free shipping minimum. Free shipping is central to many online shoppers’ experience, so much so that nearly half of online shoppers admit to occasionally increasing the size of their orders to hit the free shipping threshold. Retailers have learned something else interesting about your online purchases. Mintel’s research shows that the selection of products consumers buy online depends on whether they have an immediate need to use them. That is to say your online purchases, like my face cream, are more likely to be classified closer to the category of an impulse buy. The growing trend toward purchasing online over the phone, especially by men, makes buying on impulse easier still. Apparel, accessories and electronics lead list of items most likely purchased. Online retailers are now figuring out to expand on that. They have my full faith and confidence because marketing is the kind of thing America does really well. They do it so well that Americans have a very difficult time saving money. The average American saves less than 5%. Mexico doesn’t have a lower cost of living merely because of the lower cost of healthcare and housing and food (although that might be enough). It is also cheaper because Mexico’s culture is not driven by the most advanced, sophisticated marketing machine in the world like yours is. Sometimes that machine is a glory to behold. When I have a little extra to spend, I rhapsodize about just how fabulous it can be - Nordstroms, Amazon and Whole Foods are all amazing. It’s not that I don’t admire American marketing brilliance. In fact, living in Mexico part-time makes me admire it even more. Many an U.S. citizen gets off the plane in Mexico and immediately sees an opportunity of creating and selling something. Most of us seem to carry at least a trace of the genetic mutations that culminated into the frenzied, opportunity-seizing hominids Americans are today. The Top 10 most admired retailers in the U.S. aren’t just admired for their level of service (which is apparent when you see that Apple is in the list). They are admired because they sell a boat load of product. While Mexicans are ingenious in many things, marketing brilliance doesn’t garner the same admiration in Mexico and they clearly are not as good at it. To illustrate that, an expat friend of mine told me that she often went to the same store to buy an item she needed. Often they were out. When she remarked to owner that she loved the product, he told her he quit carrying it because he kept running out. He didn't like to disappoint their customers. That story tells you a great deal about Mexico on many levels. Mexico has different cultural priorities. A related aspect of livng in Mexico that saves you from your crazy spending self is that Mexico is still largely a cash country. Even in this day and age, paying cash makes you more aware of your spending. As an illustration of that, many of my friends back home have started carrying a set amount of cash with them when they go out at night rather than using credit cards. If I’m not mistaken, ease of spending was one of the key reasons credit cards were invented in the first place. In Mexico, people usually pay even their electric and water bills in person and in cash. Credit cards are much harder to get. The mail service being what it is (bad), you will rarely order something online when you live here (although you can use UPS and other mailing services). I would never have have ordered that face cream had I been surfing the web while in Mexico because I don’t trust the mail system. While Amazon is making in-roads, so far most expats will only chance the small purchase. With the peso at over 19 to the U.S. dollar, you can still get into trouble. I won’t demonize the credit and debit card industry (although it’s tempting). Using a credit card for Uber and a host of other online services makes comfortable part-time expat life possible. The key is to determine how to make both the American system and Mexican system work for you. Another thing to consider in buying online is who you will be dealing with if you have a complaint in future years. In the future we will be turned over more and more to bots. Facebook didn’t just sell your profile data years ago.They sold companies information on how we communicate online so that customer service bots can be programmed to respond in a more human way. You are probably already talking to bots much more than you realize. Bots have generally been written about as a positive development; answering routine inquiries and saving time (money) for companies. They will also add a whole new layer between us and the companies we interact with online, including the ones that seek to fleece us. The good news is that people won’t be able to abuse the poor $15 an-hour customer service people anymore. The bad news is that we won’t be able to talk to any real people period, anywhere in the loop. I don’t see bots making their way into my day-to-day transactions in Mexico any time soon. Mexico is very people-intensive. You will notice how many more people serve you at the car wash, the coffee kiosk or the department store. Mexico throws people, not technology, at its points-of-sale. Your more personal relationship with your money and with vendors in Mexico make you more aware of how you spend your money - no matter how much you want your skin to look like Meryl Streep’s. "Ducking Out: The View of America's Economy from Mexico" -Ventanas Mexico on how is looks from a rear-view mirror. Most recent New AT&T plan in Mexico takes away the decision-making process for the full or part-time expat. Next up: You can score some astonishing views if you brave a few month off-season. But don't fall in love with the first thing you see...play the field. 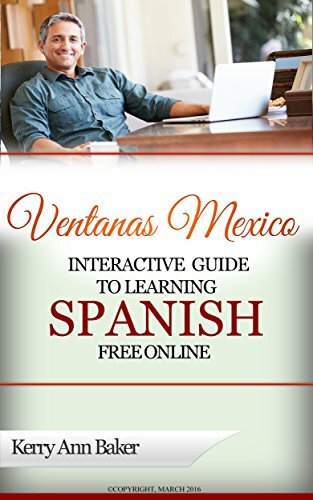 I'm Kerry Baker, a partner for Ventanas Mexico and the author of the "Interactive Guide to Learning Spanish Free Online." The best of online tools that Google (and expensive online courses) don't want you to know about, with lesson plans. 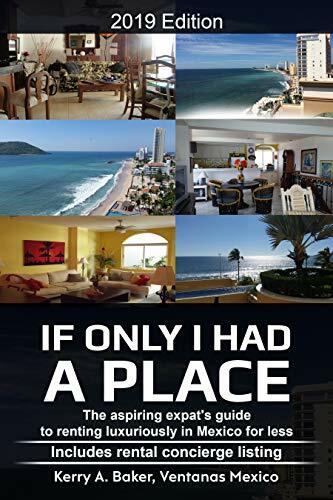 Recently I released, "If Only I Had a Place" for aspiring expats planning their first long-term stays in Mexico. This book gives you a fluid system to use year after year, and a listing of local rental concierges in all the popular expat destinations.